I picked up this ebook on a day it was free and then it sat on my iPad until I read a post on Felicia’s blog with recommendations for romance books. Eloisa James was recommended. When I went looking for her books I realized that I already owned one. This is her memoir about her family’s year in Paris. It was developed from her Facebook posts so it contains mainly short snippets of information about her days interspersed with longer essays. She is an American who is married to an Italian man. They live in New Jersey and have 2 kids. They move to Paris and enroll the kids in an Italian language school because they are fluent. Her son is taking classes like architectural drawing that he isn’t interested in so he doesn’t do the work. Her daughter is now a child who is well acquainted with principals’ offices on two continents. Eloisa walks around the city sampling the food and getting mad that her husband is losing weight as fast as she is gaining it. Background – They had a Chihuahua named Milo. He used to fly back and forth from the U.S. to Italy with them when they visited her husband’s family. But Milo got fat. He got stranded in Italy because he was too heavy to fly back to the U.S. in the cabin. So Milo has been staying with Italian Grandma until he loses weight. Yeah, it’s not happening. Occasionally she reports in on Milo’s vet visits with Grandma. I have never been that brave. I read a lot of the Milo sections to my coworkers. They thought they were hysterical. Yes, this is our life. Our first trip out of Nice was to Villefranche-sur-Mer. This was the trip that made me insist that the husband read the guidebook entry for any place we were going from then on. We missed a lot here because he kept insisting that there wasn’t anything there. It is 6 km east of Nice and is a port that a lot of ships use. We were lucky to hit it on a day with no cruise ships. Every other time we went past there were at least two cruise ships in the harbor. It looks like there is sand on the beach but it is actually rocks. Most of the Riviera beaches don’t have sand. We climbed up a hill and found this nice square to sit in. At several places around Nice there are installations of art that has been done featuring the place you are visiting. The husband never mastered the name of this place. He insisted on calling it La Mer. I told him he couldn’t do that. He said that he could say that he had a great meal in La Mer. I told him that that meant that he had a great meal “in the sea” which was entirely untrue and that he was not the boss of the town and was not allowed to change its name. He tried and tried but never could say it. We took the train there which only took a few minutes but because of strikes when we tried to go home we had to wait 1.5 hours at the station to get a train. There is supposed to be one every half hour. After this we used the buses a lot more. They were more reliable. I used Rick Steves’ guidebook to prepare for our trip to Nice. The most useful part of the book for me was the inclusion of the bus numbers that went to different sites and having the bus stops on a map. I don’t know where I would have gotten that information without this book. I was all over the bus system’s website and couldn’t find it easily. We decided to try to take the bus from Nice to Monaco because Rick made it seem easy. Just jump on the 100 bus and for 1,5 euro you go to Monaco. He even suggested that you make sure you get a seat on the right side of the bus to get the best views. Armed with this cheerful knowledge we strolled to the bus stop. Our first clue that this might be a bit different than Rick had led us to believe was the vast numbers of people milling around the stop. We wandered towards the front of the line to make sure we were lining up for the right thing. That’s how long the line was. From the back we could have been lining up for anything. We were promptly yelled at by a man who accused us of line jumping. Assured that this was a line for the bus, we got in the back. Two buses pulled up. One opened the doors right in front of us. Our part of the line got on whilst enduring the hateful glares of the people who were actually ahead of us in line but found themselves without a place on either bus – including Monsieur I Hate Line Jumpers himself. There was no getting a seat on the right. It was standing room only and they were packing that bus like a sardine can. I got a spot standing in a spot for wheelchairs just behind a group of four seats that were facing each other. For the rest of story, do refer to this professionally drawn graphic. They were sitting in yellow seats which means that old people and disabled people are given priority. She starts yelling at the British people in French. Her point was that they were sitting in seats reserved for old people and she wanted the seat. Now she was noticeably younger than the older British ladies so they just looked at her. She started jabbing sa parapluie into the ribs of the guy in seat C.
The lady in seat D jumps up and offers her seat. Non! The angry French woman wants seat C. She keeps hitting the guy until he stands up. It is immediately obvious that he is disabled. He had severe balance issues. The angry French woman recoils. She starts yelling about how she didn’t know he was sick. This wasn’t an act of contrition. She was spitting out the words with scorn and hate. The lady in seat B gives the crazy French lady her seat. 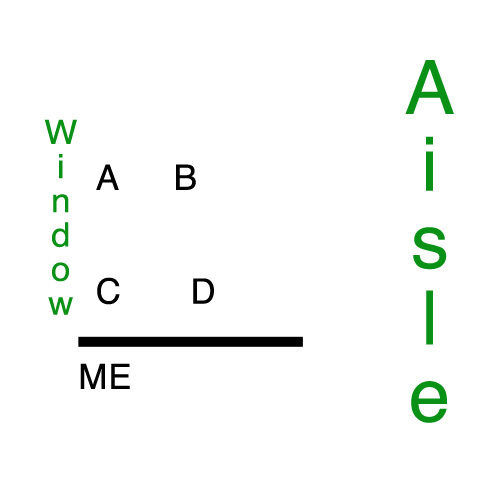 The woman took it but sat with her knees out in the aisle (which was jammed with people) and glared at the world probably because she had to sit near a person she deemed inferior. She kept her back firmly to him. The French ninja sat in C and kept beating sa parapluie on A. She grudgingly allowed other old ladies to sit in B and D. Guess who she was saving A for? Her 20-something non-disabled daughter! Crazy old bat! I’ve never seen anything like it and I’ve ridden the bus in South America. The bus did get us there though for cheap and with a story that we probably would have missed on the train. We planned on taking the train back but the 100 bus stopped in front of us as we were on our way to the train station so we got on. This time it wasn’t crowded and we got a good seat and the ride went much more like we read about it in the guidebook. Please join this weekly meme. Grab a copy of the photo above and link back to An Accidental Blog. Share with the rest of us your passion for France. Did you read a good book set in France? See a movie? Take a photo in France? Have an adventure? Eat a fabulous meal or even just a pastry? Or if you’re in France now, go ahead and lord it over the rest of us. We are going to Nice in October. I’m trying to remember some French. I had two years of French in high school and I got all As. What can I tell you in French? I can insult you because one day my English teacher had us memorize a naughty sentence and go tell it to our French teacher. That’s what I remember. I’m working with Duolingo to regain some skills. I’m using the app on my iPad but there are other formats. It works like a game to help you learn a language. If you make too many mistakes you have to take that lesson over. Right now I’m able to make some sentences. I don’t think they are particularly useful sentences. I know I had tone when I had to repeat sentences about how I was eating meat and beef is good meat. Not useful for vegetarians going to France. LOL. I hope I see lots of red apples. Une pomme rouge has been a popular phrase in this game if I don’t get to use it I will be very sad. Actually, I will probably get so excited that I’ll totally forget the words. I figure that right now I sound like a dimwitted two year old. When the husband was peeling sweet potatoes I announced, “L’homme est cuisine!” (The man is cooking.) I was proud. He was mildly concerned. Duolingo isn’t just for French. You can pick all kinds of languages to learn. So try it if you want to see how much you forgot about whatever your high school language was. During the 1800s many Americans moved to France to learn. Some studied art. Some studied medicine. Some were diplomats trying to make sense of the increasingly unstable country they found themselves in. What they would learn during their time in France would impact their lives and teach them useful skills that they took back to the young United States. I was a bit confused when I started this book. I was listening to the audio and it starts with a whole cast of characters that it is jumping and forth between. It throws dates around willy nilly. I wasn’t sure that it was going to settle down and start making sense as a consistent narrative but it did after the first few chapters. It starts out discussing the lives of American artists who went to study in France. In the early to mid 1800s there were no museums in France and no way for artists to see the masterworks of Western art without traveling to Europe. I had never thought of that. The book focuses on Samuel Morse, a talented painter with a side interest in inventing. His master work was Gallery of the Louvre. 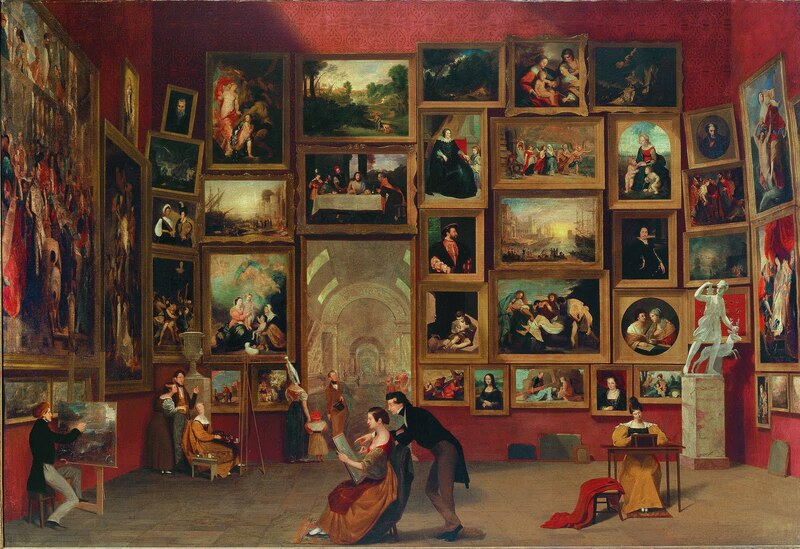 He imagined his ideal gallery with all his favorite paintings in one place. His idea was that he would take it back to America and show other artists the works that they hadn’t seen. He also painted his friends into the picture. That is James Fenimore Cooper and his family on the upper left. Cooper came every day to the Louvre to watch him paint. I didn’t know that Samuel Morse was a painter. Eventually he gave up his successful career and focused on his invention – the telegraph. Medical students came to Paris too. There weren’t any equivalent medical schools in the United States. Elizabeth Blackwell, the first American woman to earn a medical degree, came but had to study midwifery because no school would admit her. Several of the students who studied in Paris at this time went home to found medical schools in the U.S. based on the French models. Sometimes the most important things students learned wasn’t in their area of study. Charles Sumner enrolled in the Sorbonne and noticed that black students were treated no differently than white students. He decided that racism was learned and not innate. He because such a vocal abolitionist Senator that eventually he was savagely beaten on the floor of the Senate. Elihu Washburne was the U.S. Ambassador to France during the siege of Paris in the Franco-Prussian War. He wrote a diary that gives insight into conditions in Paris. He was the only foreign diplomat not to flee the city. Because of this he aided in the evacuation of British civilians in addition to American citizens. This section discussed French politics of the late 1800s when it appeared that the French people had lost their collective minds in my opinion. 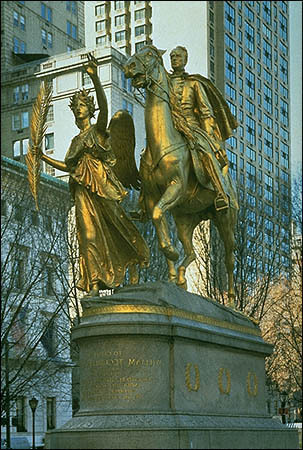 The book ends with Augustus Saint-Gaudens, a sculptor from the United States who studied in France and used French craftsmen to make his large Civil War monuments like this monument to General Sherman. There are many more people profiled giving an overview of the history of France in the 1800s as seen through the eyes of Americans.